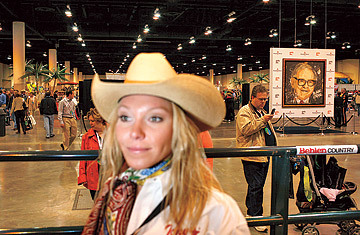 Attendees check out a Berkshire Hathaway - owned bootmaker as Buffer's portrait looks on. A 77-year-old Nebraskan who lives in a house he bought in 1958 and reimburses his company for personal telephone calls might make an unlikely candidate to be the most revered capitalist of our day. Yet that's what Warren Buffett is. And every year, devotees travel to the Berkshire Hathaway annual meeting--part corporate event, part tent revival, part family reunion--to pay him homage.